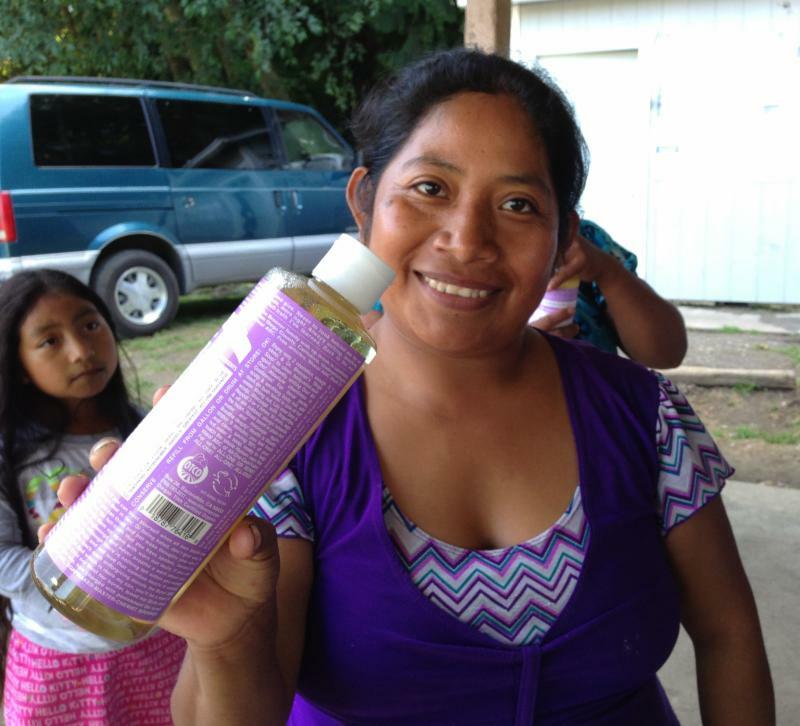 Member of Familias Unidas por La Justicia with soap donated by Dr. Bronner’s during the 2013 strikes at Sakuma Bros. Berry Farm. Photo courtesy of Community to Community Development. At the 2014 DFTA Annual Meeting we had the privilege of hearing from Patricio Santiago, a farm worker leader from WA State. Patricio shared with us the story of Familias Unidas por La Justicia, a farm worker union formed in his community during a series of strikes at Sakuma Bros. Berry Farm in Burlington, WA. The farm workers went on strike in the summer of 2013 to call attention to labor malpractices on the farm including racial harassment, poor living conditions, and wage theft. The result was a series of legal victories including an $850,000 settlement after more than 400 workers approached the company with a federal class-action lawsuit over stolen wages–the largest farm worker settlement in the state’s history. Despite this victory, Sakuma Bros. Inc., continues to fall short in providing employees with a fair wage, decent living facilities, and paid rest breaks on the job. In response, Familias Unidas por La Justicia has called for a boycott of Sakuma Bros. Inc., as well as its largest distributor, Driscolls, until a union contract is signed. Domestic Fair Trade Association members were some of the first to stand with the striking farm workers. Statements of support, food and other goods were sent to the workers in a powerful demonstration of solidarity throughout the supply chain. Additionally, the DFTA joined over 50 organizations and businesses across the food and farming system calling on Driscoll’s not to source from Sakuma Bros. Inc., until the labor dispute is resolved. The organizational sign on letter was sent to Driscoll’s CEO and Chairman on April 30th, 2015. For more background on Familias Unidas por La Justicia and the boycott check out these resources. Video: “Our Work is Life” short documentary about Familias Unidas por La Justicia. Finalist in the Real Food Media Contest.